Bells have rung out from the Minster since 1050 and we know that there was a ring of eight bells in 1430. They are still ringing today at this wonderful place. The bells however require human input and that is the reason for this piece. A bell will out-live a ringer over ten fold years so in order that the art of ringing is kept alive we must keep recruiting and training new generations of ringers. In order to meet the needs for which the Southwell Minster bells are rung, a capable team of ringers is essential, this can only be achieved by ongoing recruitment to the band. In these times where particularly the younger person may expect to achieve a skill quickly, retention of learners presents a difficulty as the learning process is relatively slow. The factors that govern this is the actual ‘time on the end of a rope’ learning to ring a bell balanced against the needs of the rest of the band to progress and enjoy their hobby always presents a Tower Captain with a challenge. In 1961 the bells were augmented to 12. Southwell is very fortunate to have such a beautiful ring of bells that can be rung for service, weddings, special occasions and also National events. The art of bell ringing is a skill that most people from 8-80 years can enjoy. You do not have to be strong, musical nor have a mathematical brain. You will discover a special talent called 'ropesight' but you need to be a ringer first to uncover the mystery of it! Here is an analogy: learning to ring is very much like learning to ride a bicycle. When you first get on a bicycle it’s about balance, not falling off, turning the pedals to move forward and of course the steering. A lot to do all at once but never the less all essential. That is just like handling a bell, learning how hard to pull the rope, how to hold and catch the moving rope, finding the balance point, how to hear your bell amongst the other bells. At this point like riding the bike, it doesn’t matter to you where you are going just that you don’t fall off. When you can ride your bike safely and with confidence it becomes natural and you wonder why you found it difficult. Bell ringing is the same, after you become confident to ‘handle’ the bell then you can start learning the ‘journey’, the methods (it’s the music really but there are no notes.) wonderful names like Plain Bob Minor, Grandsire Triples, Stedman Cinques and Cambridge Surprise Royal, hundreds of different methods. The majority of ringers only a ring a relatively small number of methods and the methods that are learnt when younger are well embedded in that part of the memory that is easy to access later in years. Essentially, the younger you learn the easier it is, the longer you have to enjoy and of course it’s up to you how far you want to go. As in all sports and hobbies the range of abilities varies and bell ringing can meet all those ranges. You are not tied to one tower, there is nothing nicer than being on holiday, usually in this country, and you hear the bells ringing one evening. You visit the tower and without a doubt you will be made welcome at their practice night and everyone will benefit no matter what skill level you are at. The same goes for Sundays. The internet has absolutely everything from advice to local church ringing times and contacts, its easy. 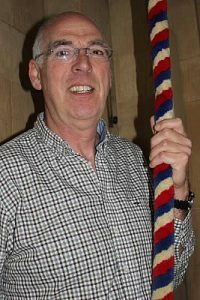 Southwell is indeed fortunate to have a dedicated band of ringers who regularly climb those 100+ steps to ring our bells. The aim being to strive for the best ringing and best striking possible of the bells. Also to recruit and retain a band that regularly ring 12 bells beautifully. Lastly we know for certain that in Southwell and around about there are lapsed ringers. Ringers who have learnt somewhere else, lived and rang somewhere else, maybe at a smaller tower and feel ‘daunted’ by the size of the Minster. Perhaps you learned to ring then other commitments like family and work took priority but things have changed. To those ringers now is the time to come back, you know you will enjoy it again. Practice Night is Tuesday at 7.30pm - 9.00pm. Sunday: 10.30am for the 11.15am service (9.45am for the once a month service). The ringers meet at the small west facing door to the central tower on the south side of the Minster, opposite The Great Hall, 10 minutes before ringing.